This article explains the Request Session ID, also known as the "Request ID", the "reqid" or the "Session ID". What is the Request Session ID? When do you use the Request Session ID? How do you use the Request Session ID? When does the Request Session ID change and how does this affect tracking? Section 1: What Is The Request Session ID? The Request Session ID is a numerical value that CAKE generates and stores upon a click of a unique tracking link. This numerical value is intended to be used with the CAKE Postback URL (S2S) for the purpose of tracking conversions or events. The Request Session ID can also be used in API's to make updates to existing conversions or events. Section 2: When Do You Use The Request Session ID? The Request Session ID is primarily used in situations where a Postback URL (S2S) has been implemented with an advertiser. This form of CAKE pixel requires this value in most cases. The Postback URL leverages the Request Session ID to track conversions or events in the absence of a cookie. Postback tracking, or Server to Server tracking (S2S) is becoming more common in mobile tracking and offers that require additional security. This is a requirement with mobile app tracking in CAKE. Section 3: How Do You Use The Request Session ID? Upon a click of a CAKE unique link, the Request Session ID will be generated and stored within CAKE. To use this value for Postback URL tracking, however, this value must be appended to the advertiser's redirect link so that they can store this value and pass it back upon a conversion. To pass the Request Session ID to your advertiser, use the Request Session ID token in the identified parameter within the Offer Link. See the example above. Once the user redirects to your landing page and converts, your advertiser will use the Postback URL to make a call to CAKE for the purpose of tracking a conversion or event. You can generate the Postback URL on the Offer Card by pressing on the Pixel button. From there, select the Postback URL to provide to your advertiser and inform them to pass the Request Session ID in the r= parameter. Tracking conversions and events generally depends on the Cookie Duration setup on the offer within the Attribution Tab. By default, CAKE offers are set to a 30 day cookie. This means, while using a Browser Pixel, that CAKE will only track a user within 30 days of the click. If the CAKE pixel fires after the Cookie has expired, CAKE will not track a conversion. Postback tracking, however, is slightly different. Because the Request Session ID can be used for updating conversions or events at a later date, the current intended behavior of the Postback URL is to ignore the Cookie Duration. This means that a consumer can click on a CAKE tracking link and convert via a Postback URL once the cookie has expired. 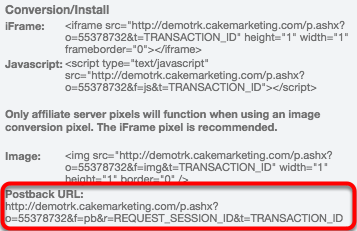 Upon a click of a unique link, CAKE will generate and store the Request Session ID. CAKE makes this value available in reporting for troubleshooting and reporting purposes. The Request Session ID can be found in the Click Report. Depending on how your custom Click Report views have been setup, the actual column may be in a different position than the example above. The Click Report is very useful when troubleshooting conversions or events. Often times you will need to reference the Request Session ID of a click to ensure that the advertiser is passing the correct value on the Postback URL. Server tracking, which leverages the Postback URL and the Request Session ID, follows the same attribution rules as tracking conversions via a Browser Pixel. 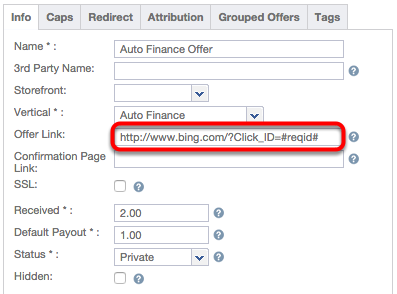 With that said, every offer allows you to define an attribution model of either first click or last click. This setting will either provide attribution credit to the first Affiliate who generated the click or the last Affiliate. Events are an optional tracking feature in CAKE that allows you to track actions other than the default conversion. For example, a consumer registering to an online clothing store may be tracked as a conversion. Once the consumer makes an online purchase, however, that may be optionally tracked as an event. Often times an advertiser may choose to leverage the Request Session ID to track unique consumers for the lifetime of shopping online for the purpose of making additional payouts to an Affiliate. It's important to know that CAKE will continue to credit the original affiliate who generated the first conversion using that Request Session ID. As long as that Request Session ID is used for tracking additional events, CAKE will continue to attribute the event to the original affiliate. Section 7: When Does The Request Session ID Change And How Does This Affect Tracking? A user clicking on different offers within the same session will result in the SAME Request Session ID. CAKE maintains the same Request Session ID because the user is still in the same session. Even though the user has clicked on multiple offers, CAKE can still track each conversion uniquely because the Postback URL will contain the specific Offer ID. A user clicking on different offers within different sessions (user exiting the browser and opening a new browser) will result in DIFFERENT Request Session ID's. 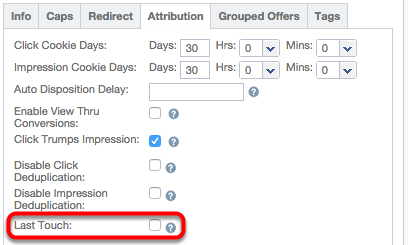 CAKE will generate a new Request Session ID and will display this value in the Click Report. It's important to know, however, that CAKE will continue to pass the ORIGINAL Request ID to the advertiser as this will be required for converting. CAKE generates a new Request Session ID internally to help identify duplicate clicks. A user clicking on the same offer multiple times within the same session will result in the SAME Request Session ID. CAKE will maintain the same Request Session ID and will expect this value to be passed in the Postback URL to track a conversion or event. The user is in the same session and therefore maintains the same value. A user clicking on the same Offer multiple times within different sessions will result in DIFFERENT Request Session ID's. Upsells is an advanced feature in CAKE that allows you to track a consumer through a series of Offers as opposed to tracking the consumer on one single offer. Upsells may be tracked in the same session or in different sessions across a period of time. In either case, the Request Session ID can be passed along from offer to offer for the purpose of tracking the user. There are two methods to redirecting a user through an upsell "Path". You can either create an upsell path within the vertical / offer or you can redirect the user through an upsell tracking link manually. In either situation, CAKE will continue to pass the original Request Session ID from the original click to the upsell Offer. This is true IF the user is redirecting to an upsell offer within the same session. If the user is redirecting to an upsell offer in a DIFFERENT session, CAKE will generate a NEW Request Session ID and will expect to track a conversion with the new Request Session ID.